This article first appeared on Unlocking the Bible on November 23, 2015. The air was a balmy 75 degrees, hardly autumn weather. Our dinner guests enjoyed the beautiful day sharing a meal around folding tables pushed together on our covered patio. The dinner table didn’t look like a magazine picture of Thanksgiving, but we were celebrating this favorite family holiday surrounded by loved ones enjoying all the same delightful foods found at the most traditional of holiday meals. Our Thanksgiving plans began just weeks prior when a few friends decided to gather at our house to share their favorite dishes. Everyone knew they were welcome to invite others who were otherwise going to spend the holiday alone, and before we knew it, our “family” meal grew to include over 20 people. At the grocery story, my friend Connie and I ran into yet another couple that would be alone that Thanksgiving, so we convinced them to join us too. As in many homes, at Thanksgiving everyone around our table is family, whether or not we’re related. Sharing a meal with loved ones is important, at Thanksgiving or anytime. In today’s fast-paced world, the dinner table might be the only place where families can gather together in the same room during the week. Your children will be under your roof for a relatively short time. Before you know it, they’ll be away at school and tackling life on their own. One day you’ll wake up and wonder where all time went. Don’t let the opportunity to eat together pass your family by. When we eat together with our children, we’re nourishing more than our bodies. We’re nourishing our hearts as well. And David said, “Is there still anyone left of the house of Saul, that I may show him kindness for Jonathan’s sake? King David invited Mephibosheth, the son of his friend Jonathan, to join his table. This was no ordinary act of kindness. Young Mephibosheth was a descendent of King Saul, the king who had been replaced by King David. No other monarch would invite a potential enemy to join his family dinner. But David was demonstrating the kind of love that God demonstrates toward us. 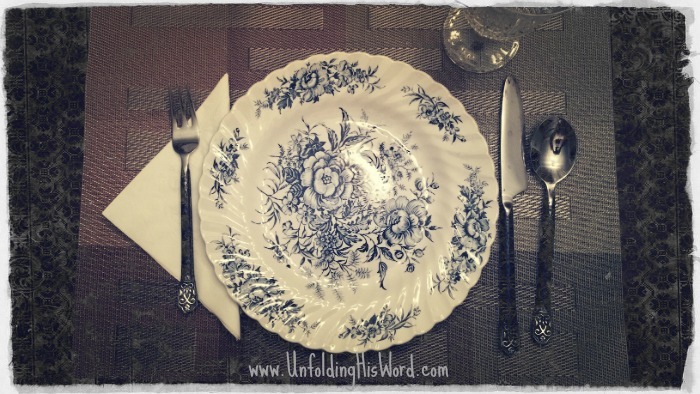 God, the King of Kings and Lord of Lords, invites us to join his family table as well. Just as David is a picture of Christ welcoming us, we are like Mephibosheth, the recipients of grace. Though we are born alienated from him and crippled by sin, we are treated like joint heirs, sons and daughters of the Living God. We are no longer outsiders, separated from God. We’ve become joint-heirs with Christ, and we can never earn the grace we’ve received. Our Thanksgiving tradition of inviting friends to join our family continues. Sharing a meal is one small way of sharing the love we ourselves have received. If you have the opportunity to show grace this year by inviting someone to join your family at Thanksgiving, I hope you’ll take it. We demonstrate the love that David had for Mephibosheth for Jonathan’s sake, and the love that God has for us for Jesus’ sake, when we share that love with others. Many blessings from our family to yours this Thanksgiving.